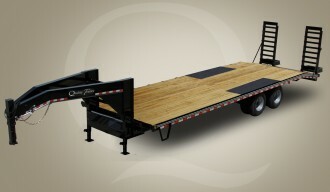 At Quality Trailers, we manufacture a broad line of gooseneck deckover trailers to fit any need. This includes two different types of trailer. General Duty: Standard I-beam frames with 24″ cross member spacing, rubber mounted sealed beam lighting in enclosed boxes with conventional wiring with gel filled connectors. Professional Grade (in addition to General Duty features): Heavier main frame I-beams and side rails with 16″ cross member spacing allow a higher GVW rating, premium radial tires, toolbox with lockable lid (standard on all professional grade models), LED rubber mounted sealed beam lighting in enclosed boxes with sealed modular wiring harness.